mesofiller®, the latest generation of dermal implants based on reticulated hyaluronic acid to correct wrinkles and restore facial volume. 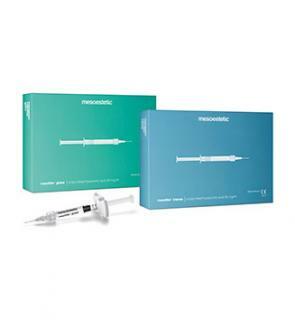 High quality dermal implants with cross-linked hyaluronic acid. It is a monophasic transparent gel of non-animal origin and completely absorbable. The mesofiller® range is based on DENSIMATRIX® technology, a revolutionary cross-linking method associated with an intensive purification process. This unique technology enables the cross-linked of 100% hyaluronic acid chains to ensure better resistance to enzymatic degradation and maximum purity.